Wanna See Some Chalkfest Pictures? OK, so the response to Chalkfest was overwhelming. A short film documenting the legendary FATFAR (Frenchtown Annual Tube Float and Regalia) event in Chippewa Falls, Wisconsin, where an average of 3,000 people float down the Chippewa River each year. Local music by Orestus. 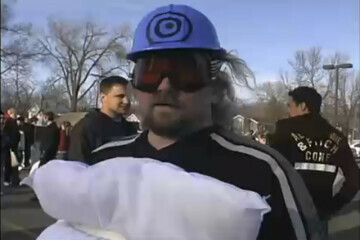 Every April 1st in downtown Eau Claire, hundreds of individuals gather for Volume One's April Fools' Day Pillow Fight for five minutes of feathery fury. This short official video documents the 2008 event and celebrates the absurdity of it all. If you or someone you love has four legs, feathers, and/or a tail - you`re gonna love this. Welcome to Volume One`s first guide to growing and networking a local musical group.